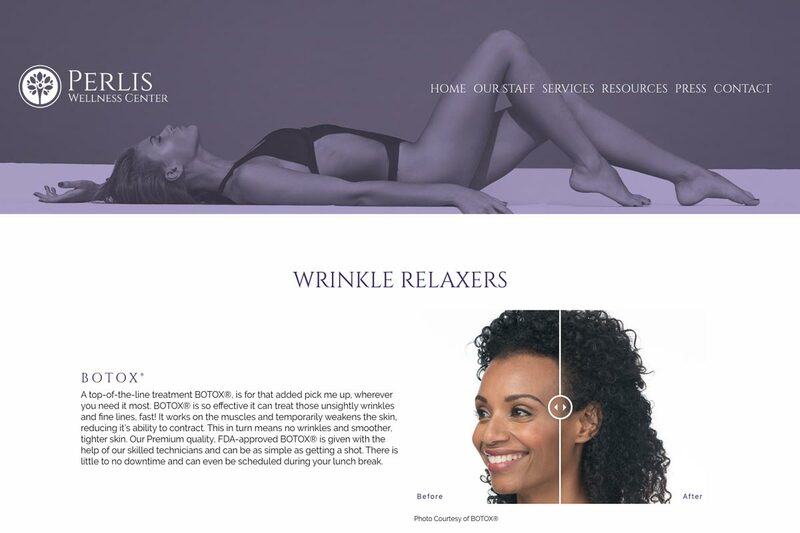 Perlis Wellness Center is an upscale medical spa in Chicago that was in dire need of a website that perfectly highlighted and reflected their incredible reputation. There also had to be an emphasis on appealing the new style to the company’s sophisticated clientele. Creating a website that reflected who they are was the center’s primary concern and they asked us to help bring their vision to life. They wanted a look that was clean, elegant and polished as their old website was anything but. The references Dr. Cheryl Perlis and her amazing team gave us consisted mostly of high-end fashion content and a lot of black and white photos that embodied their vision. Taking this information, our graphic designer implemented an overall sleek aesthetic that modernized their look. The final touches involved pleasing visuals and using a Pantone of color pulled from their logo. After creating an eye-catching look and navigation, the clarity of the content needed to be changed. Before we took on this challenge, the message that Perlis Wellness Center was trying to communicate was muddled and unclear. Our content manager, Michael, provided written marketing copy that better translated the company’s vision and appealed to its target audience. “Perlis Wellness Center caters to a very high-end crowd, so the content had to appeal to them. I think we managed to do that,” Michael said. One of the biggest determining factors of whether or not a website will be successful has a lot to do with its user-friendliness. We brought that to life by incorporating an easy-to-use navigation bar. With over 90% of online users viewing sites through mobile devices, it was crucial that Perlis Wellness Center’s website also be mobile-friendly. We were able to achieve that, making the final product look and work great. If your website needs revamping, then don’t hesitate to give us a call today at 956.687.1521. You can also feel free to provide as much information about your needs here. At Imagine It Studios, we’re always looking for our next challenge. There’s no doubt that our web developers in McAllen can provide the solutions to your digital marketing needs!